It might be one of the coolest things to hit crowdfunding site Indiegogo. Meet Trinity, an ARM-based, Android-powered smartphone that also doubles as a traditional personal computer. Indeed, it runs Windows 10 on a second Intel-based processor with its own memory and storage. Physically, it looks like a rugged smartphone but bulkier with a 19mm thickness, that’s partly because of the plethora of connectors onboard. The device comes with two HDMI ports and two full size USB ports but no micro USB or audio ports. You do get a pair of speakers though to quench your thirst for sound. Trinity can be controlled via a 5-inch touchscreen display; sadly its limited resolution (800 x 480 pixels) means that you won’t be able to run Windows 10 on it. In stead, you'll need to connect a monitor via the HDMI out port of the device if you want to run the latest version of Windows. Note that you can only make calls on the Android smartphone, not on the Windows one. The two biggest stumbling blocks though are the price (north of $699 - £561 or AU$931) and delivery (December 2017). Clearly Trinity is an interesting proposal and we expect others to follow suit. Both businesses and end users are likely to love the concept since it could improve efficiency while lowering costs. 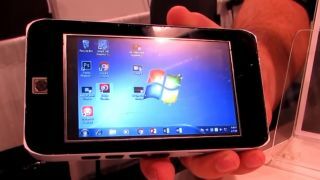 The Gole Gole1 portable PC is a potential candidate for such a transformation and we fully expect smartphone vendors like Samsung (with the S8) or HP (with the Elite range) to come up with hybrid solutions that combine both Android and Windows (or Windows mobile). The crowdfunding process, which has just been launched, aims to pull in $767,000 (about £617,000, $1,021,000). Check out our ruggedised smartphone reviews.